Please be advised that all hardware and doors are handcrafted and manufactured to order. Lead times may vary and are only estimates. Please do not arrange for an install until you have received all correct items from your order. Before assembly or installation, check to see that you have instructions. If they are missing you can download instructions at www.RusticaHardware.com. 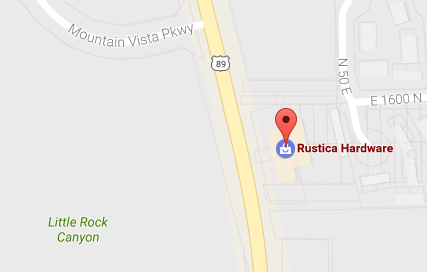 Rustica will not be responsible for any contractor expenses and/or other fees incurred outside of your transaction with Rustica Hardware. If a door and hardware are ordered at the same time, then the door and hardware will ship together on the same date. In this circumstance customers should base their estimated lead time off of the door’s production time and not the hardware's production time. For standard orders, door hardware can take 3-5 Business Days to manufacture and may be shipped via ground shipping. Freight shipping may be used when an order/product exceeds the capabilities of ground shipping. Once your hardware has been manufactured, it will ship via ground delivery service. If you require a production and/or shipping method other than standard production and standard ground shipping service, please contact us within 48 hours of receipt of your order invoice to request expedited production and/or shipping options which may be available for an additional fee. We will do everything in our power to meet your expedited needs but please be aware that expedited production and shipping are not always available and are not guaranteed. Please call us to discuss options for expedited services offered by Rustica Hardware at 1-800-891-8312. If you are not satisfied with this lead time, please call us to discuss options for expedited lead times. For custom door sizes and styles, 8-10 week lead time may apply. For questions call Rustica Hardware at 1-800-891-8312. Please note that all sales orders placed will have until the close of the following business day to be cancelled with a 5% cancellation fee. This must be done over the phone (no other form of communication will be accepted). All orders cancelled after the following business day are subject to restocking fees. Rocky Mountain Hardware products have a lead time of 8-10 weeks. If your product has a defect or needs to be exchanged you must do it within 30 days of receiving your order. No returns will be accepted after 30 days or if the product has been installed. To ensure you’ve received all the correct components, please plan the installation of your product within the first 30 days of receiving your order in case you need any exchanges or additional items for installation. Make sure your shipment includes installation assembly instructions. If not, they can be downloaded from www.RusticaHardware.com. Returns will be subject to a 25% restocking fee and exchanges will be subject to a 20% restocking fee. Please visit our Returns Page for our return process. Custom orders are not returnable. All free shipping will be shipped via ground shipping. Ground shipping will deliver your product to your door or to the “curb” for large doors. It is the consumer’s responsibility to arrange for installation and delivery beyond the curb. Please do not schedule the installation for your door until it has arrived. Expedited shipping options may be available for an additional fee. Expedited shipping may be limited due to the weight of certain products. If you require expedited shipping please call Rustica Hardware at 1-800-891-8312 for more information. Just as our name implies, Rustica Hardware specializes in rustic design and styles in our hardware and doors. Most of our doors are made from Knotty Alder and are not finished to a smooth paint grade. It is normal to have large knots in the wood that give it character and a rustic look. If you need a smooth paint finish please be sure to order a paint grade finish by calling to Rustica Hardware at 1-800-891-8312 for help placing your order. Standard kit doors are shipped unassembled and unfinished. If you are assembling your door or installing hardware yourself, make sure you have instructions before you begin. If they are not included they can be downloaded at www.RusticaHardware.com. If you would like your door assembled or finished by Rustica Hardware, please include these options with your order for an extra fee. All doors are assembled to verify that they fit properly before they are shipped and then are disassembled for shipping. To prevent possible warping, we recommend having your door finished, shipped assembled by Rustica Hardware. If you are having trouble assembling your door please call Rustica Hardware at 1-800-891-8312 for customer support. All products come with a limited lifetime warranty that covers the functionality of our products. This warranty does not cover finishes, cosmetic discoloration, damage, improper installation or normal wear. We will replace any part that fails to function properly with the return of the failed product. We love to serve all of our customers across the globe. Unfortunately, due to the variance of customs policies around the world we do not assume any responsibility of freight, duties or taxes outside of the US. However, we do offer everyone our standard free shipping for barn doors, hardware and mantels​ in the continental US. We strongly recommend that the buyer contact a freight forwarding company in the continental US to receive the product from us on your behalf. You can contact almost any international freight company for a recommendations for your country. Please note that upon delivery to the freight forwarder ownership of the product transfers to the buyer. From that point on all freight, duties, taxes (import and export) and brokerage fees will be the buyer's responsibility. We cannot be responsible for any international freight costs (or returns) so we recommend the product be inspected carefully by the freight forwarder upon receipt.